Home » Healthy » Which Better? Cut Fruit or Juice? Which Better? Cut Fruit or Juice? - Fruit juice is often recommended health experts so that we can simultaneously obtain the benefits of various fruits. The body is also more easily absorb the nutrients present in the juice. Children also love fruit juice because it's easier to consume. However, should the juice made ​​without added sugar (liquid sugar / sugar) or syrup. Let the sweetness comes from the fruit itself (fructose). Provision of additional sugar and syrup will actually reduce the efficacy of fruit juice is made​​. Juice that has been created should be drunk immediately. If stored too long, there are vitamins that can be damaged by oxygen and ultraviolet that are around us. So, when they wanted to make a juice drink. Keep in mind, though preferably fruit juices, the kids still have to get used to consume cut fruits / fresh fruit. 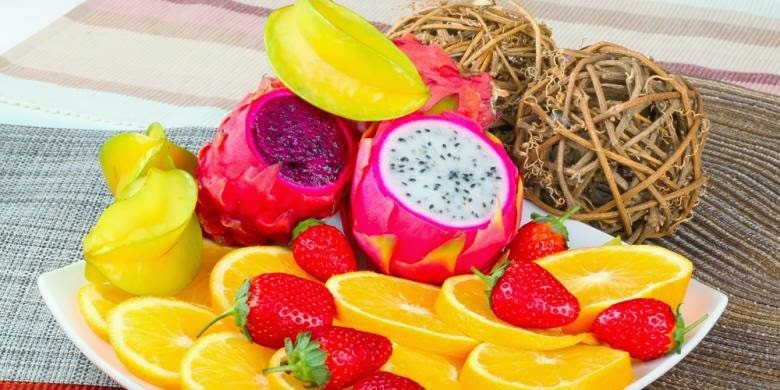 The necessity to keep eating fresh fruit beneficial to the stomach and intestines, because during the process of chewing, stomach and burn will work approximately 20 kcal. Fresh fruit will give you the benefits of fiber so that the child is free from constipation. So keep eating fresh fruit / fruit cut because not all benefits can be replaced with juice. The ideal fruit consumption is 2-3 servings of fruit a day as a source of vitamins and minerals needed to aid energy metabolism, regulate growth and plays an important role in the maintenance of body functions. Vitamins and minerals are needed in very small amounts, but for the most vitamins and minerals can not be formed by the body. Therefore, to get it to be brought in from food, one piece of fresh fruit. Try eating different fruits in 2 or 3 servings of it. For example, the morning banana, orange daytime, and nighttime eating papaya fruit.